Looking at the web pictures, I find it difficult -even impossible- to believe we’re referring to the same installation -golf course, school, dormitories, base housing, park, fountain, rec center, etc. Such amenities! Oddly, I have found nothing in the archives or elsewhere depicting the base and the ever-so-sparse living conditions at Alex after it reopened in 1950. I hope to add an earlier chapter. 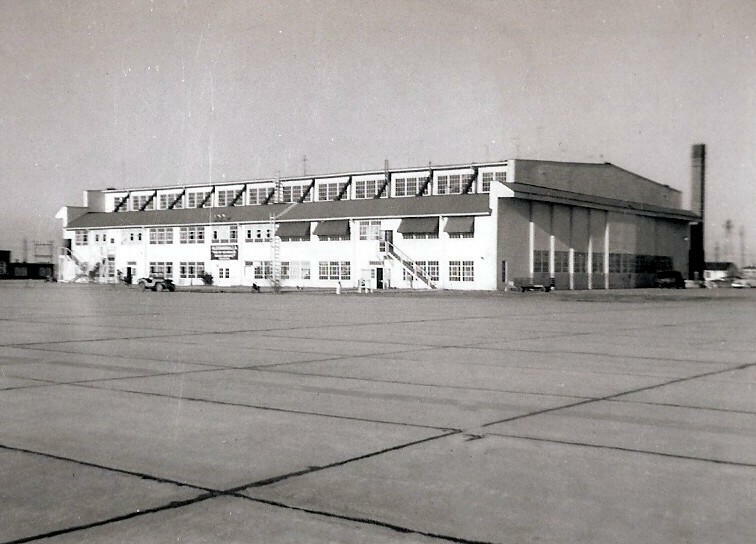 Before my transfer to the U.K. in late 1953, I had spent 32 of my 48 month enlistment at Alex; a stretch, to be sure. As a Missouri lad, I was familiar with summer heat and humidity, but nothing could have prepared me for those Louisiana days & nights! However, my long tenure at Alex gave me the golden opportunity to more than just meet the local folks. I spent Christmas and other holidays in their homes, lived off base with several families, danced with their daughters at the local Community Center, attended Pineville College, and became immersed in their customs and attitudes. To this day, I have a deep affection for Southerners. The rapid escalation of the Korean Conflict in 1950 saddled Lackland with a tumultuous influx of recruits that found me rushed through Basic Training in 6 weeks, shipped to Alex, and assigned to Base Operations as a Clerk Helper-OJT. I would later change my AFSC, trained as an Air Operations Specialist. 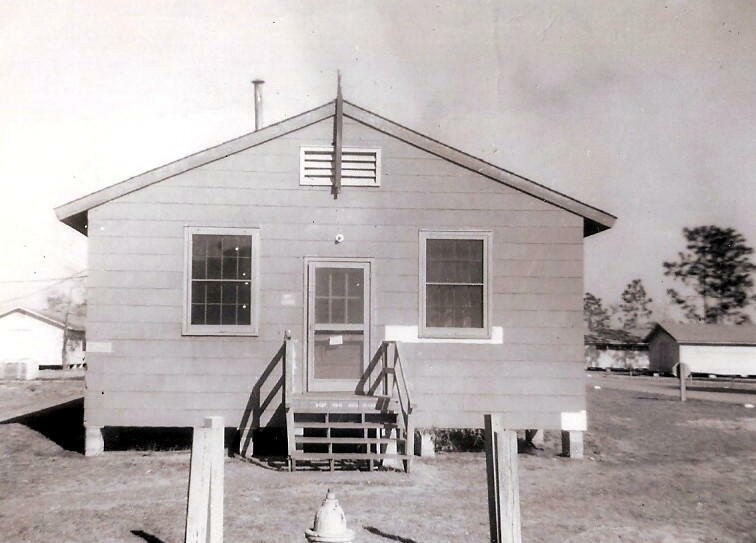 On a cold, rainy, miserable 12 January, 1951, I arrived to find the main road onto the base a sea of mud, the AP guard shack the size of a phone booth, our barracks were tar paper shacks with pot belly stoves, and no mess hall -we were issued WWII G.I. mess kits, served in a ramshackle building, then washed the kits in 50 gallon drums of boiling water fueled by a Bunson Burner. Rumor had it that the base had been a chicken/turkey farm during it’s closure. I never confirmed this, and I never saw any feathers, but Alex was definitely not the Air Force life I had in mind! Recently formed in 1947 as a separate service, the Air Force wasn’t yet up to speed: main conveyances were the old reliable Willy’s Jeep, Weapons Carrier and deuce-and-a-half. I took my military driver test in a Weapons Carrier and it was one hilarious scene until I learned to double-clutch the beast! Later on, we received new, blue Chevrolet sedans and Carryalls. New Airmen were, of course, issued “Shade 74 Air Force Blues,” but apparently, they were optional for a period of time for the old timers because it wasn’t uncommon to see many still in winter OD‘s, and a combination of the two with summer khaki’s; that is, the blue service cap, blue belt, brown shoes and old style chevrons! At Base Ops, a side job I “volunteered” for was putting out the pots. Due to years of neglect, the runway lights were inoperative and it was months before repairs were made. Meantime, when there was night flying, it was my chore to grab the jeep and trailer, load it with smudge pots, run up and down the main runway lighting and placing them, then collecting them the next morning for refilling. A messy, sooty job, but pilot appreciation garnered me some flying time! 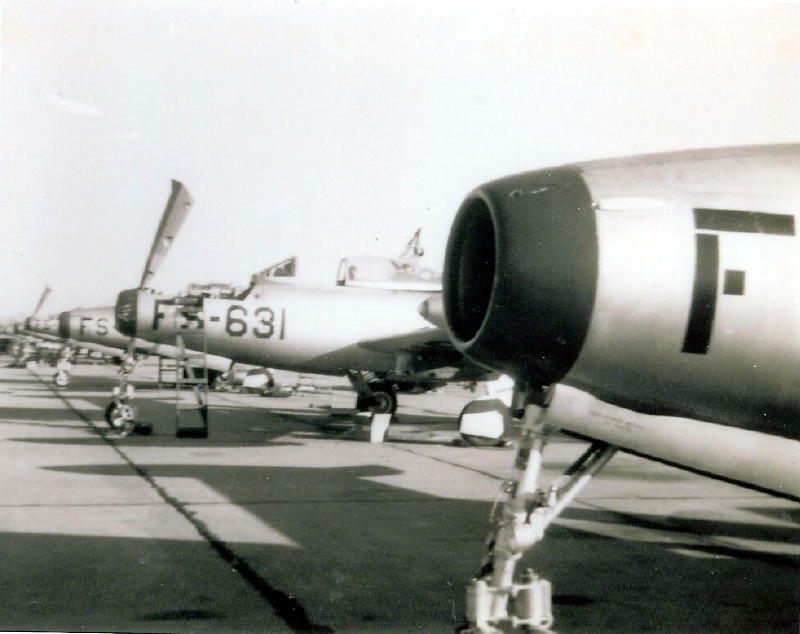 The 137th Wing was initially assigned F-51 Mustangs, later transitioning to F-84 Thunderjets, and finally to F-86 Sabre’s around the time of my transfer. 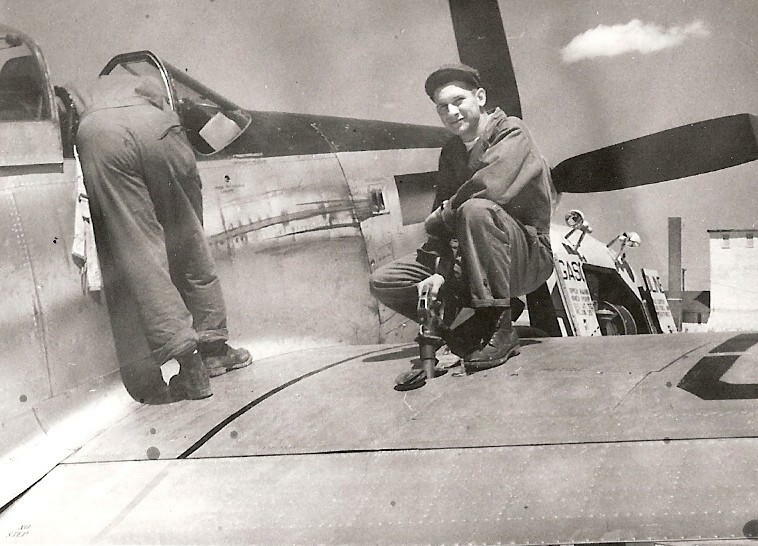 With the end of WWII barely 6 years past, most -if not all- of our pilots were combat vets who had either remained in the AF or were “retreads” due the Korean Conflict. As an Air Operations Specialist right in the heart of Base Operations, associating and working with these guys was a great opportunity and a privilege I have always cherished. Of course, it didn’t hurt to see all those familiar faces when I went before the promotion board. For a brief period, I transferred on base to the 6th Liaison Squadron, a small detachment of Search & Rescue L-20 Beavers housed at the far end of the flight line. Our Base Ops was a squad tent heated by a temperamental coal oil stove, and in the morning, I had to be doubly careful opening the flow-valve ever so slightly before lighting it, otherwise I could have been a statistic! Rescue Operations were infrequent and the squadron logged much of the time just punching holes in the sky with practice missions. I spent a lot of hours in the Beaver, a fine little airplane. Undoubtedly, our government later spent many millions transforming my old Alex into a first rate installation. And then, in true bureaucratic style, closed the Base in 1992. Sad. I hope my contribution will add to the warm memories of AEX. CONTROL TOWER, CRASH CREW SHACK AND PERSONAL EQUIP. BUILDING. BASE OPS IS TO THE RIGHT JUST OUTSIDE THE PICTURE. 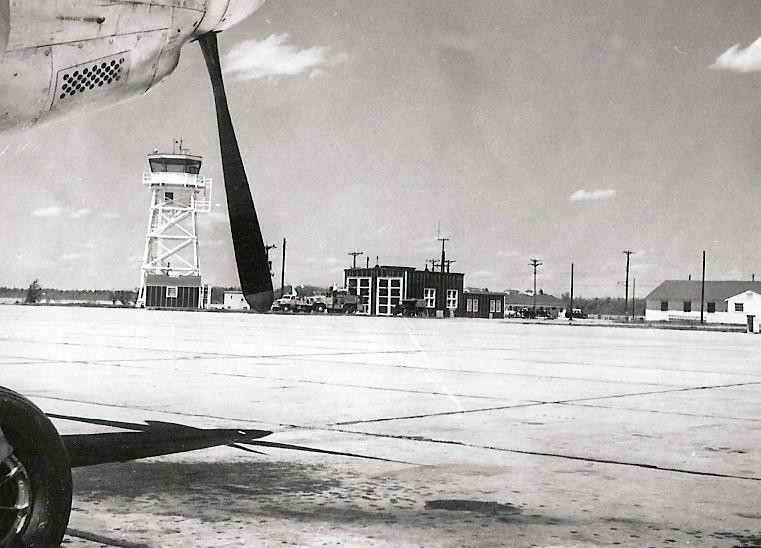 LATER KILLED IN HIS F-84 AT FT. BENNING, GA. ANNUAL U.S.O. PARADE. BENTLEY HOTEL AT LEFT. MAY 1953: DURING SEVERE FLOODING, OUR 6TH LIAISON DETACHMENT PERFORMED RESCUE OPERATIONS PICKING UP STRANDED PEOPLE ALONG THE BAYOU LEVEES. PILOTED BY 1/LT. ROBERT L. ENANDER, THIS LANDING DIDN’T WORK OUT TOO WELL. BOB BARELY GOT OUT AND WAS CHARGED WITH PILOT ERROR. I’M STANDING ON THE BANK IN T-SHIRT PREPARING TO WADE IN AND RECOVER THE AIRCRAFT LOG. NICE JOB -FROGS, SNAKES AND ALL. FEB. 1951: ALEX SUFFERS AN UNUSUAL SNOW STORM CAUSING THE ROOF OF THE NEWLY CONSTRUCTED MESS HALL TO COLLAPSE. Be sure to see the pictures after my story!